The pressure inlet boundary condition defines an inflow condition based on the known pressure value, \(p\) at the boundary. It calculates inlet velocity value from the flux at the boundary. For Incompressible flows the temperature properties are not required, while for Compressible flows the temperature at the inlet must also be defined. The relevant turbulent flow quantity values are taken same as the initial field values. Total pressure: fixed or table. The total pressure value type is the most common method to specify the pressure at the inlet boundary. (The user could specify a parameter \(\gamma\) which is used in transonic and supersonic cases). The pressure \(p\) is calculated at the boundary based on the fixed Total pressure, \(p_0\), that must be specified. Since the velocity is calculated, so as velocity changes, pressure \(p\) is adjusted accordingly untill it reaches a converged value. When using Pressure Inlet of type Total pressure, it is generally recommended to use Pressure Outlet boundary condition type. Inlets of pipes or other wall bounded flows. 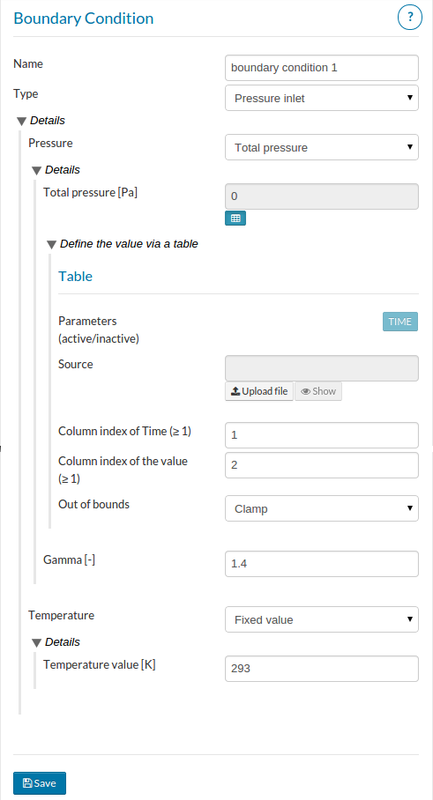 Alternatively, it is possible to set boundary values by uploading a CSV file. For this purpose, the user should choose File Upload as the Input Type. Correct dependencies should be chosen. In this case, the uploaded file contains values that are dependent on Time only.